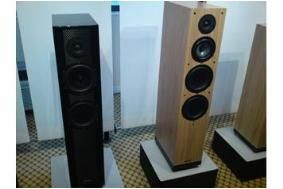 BRISTOL SHOW 2010: Introducing the ST Carbon and A9 speakers from Spendor | What Hi-Fi? The ST Carbon is a 2.5-way design, and has a black piano lacquer cabinet with the option of carbon fibre or 'exotic ebony' inlays on the front of the speaker. Spendor boss Philip Swift says the company will also make custom inlay finishes, such as leather or fabric, to special order. Spendor has developed a new 18cm Kevlar composite, polymer loaded low frequency driver and a new 18cm polymer cone mid/bass driver specifically for the ST.
And a new 29mm wide-surround tweeter, with bi-elliptical acoustic lens technology, "combines the extended frequency response of a small diaphragm with the low frequency characteristics of a larger diaphragm", says Spendor. A crossover network with high-grade electrical components, super linear 630V low-loss dielectric capacitors and WBT next-gen terminals integrates all three drivers in a phase aligned configuration. Also new from Spendor is the A9 floorstander. It's a 3-way design with two Kevlar mid/bass drivers and a tweeter developed from the A5 and SA1 series. It's available in four finishes: light oak, dark wood, cherry and black ash.